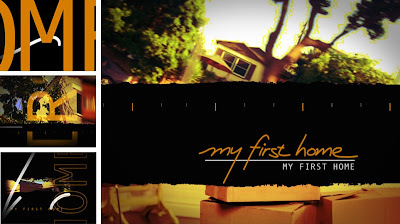 jonberrydesign Delivers Graphics for New TLC Series "My First Home"
Los Angeles broadcast design studio jonberrydesign designed and produced the main title and graphics package for the new series "My First Home" on TLC. My First Home follows first-time homebuyers through the process of hunting and buying their first home. "This solution took longer than usual in the concept stages," said Designer/Creative Director Jon Berry. "I kept bringing very bright, clean, bold designs and they weren't hitting the mark for what they wanted." Finally, in a brainstorm discussion, Begley showed Berry an image of a pen scribble that inexplicably attracted her, and Executive Producer Tom Rogan mentioned wanting "gritty without being gritty." Those two comments set off a light bulb that led Berry to the concept of a diary. "'My First Home' follows very personal experiences in a more cinema verite style than most home shows - essentially a video diary," said Berry. The diary concept deconstructed into elements of handwriting, torn edges, typewriting, raw handheld still photography, and a series of tick-marks representing the stages of the process. When in motion the handwriting texture even referenced film leader as a nod to the cinema verite style of the show. The gritty comment also led Berry to a palette that was dominantly black and grey with a very warm orange accent color instead of the bright and white and primary color palettes of his earlier designs. "I received a two word email in response to those boards: 'LOVE IT!' From there, all elements just seemed to fall into place," said Berry. jonberrydesign is the Los Angeles based studio of Jon Berry, an award-winning broadcast designer/animator and creative director of television branding, motion graphics, promotion campaigns, main title design and show packaging. For more information, contact Jon Berry at 213.926.1678, or visit jonberrydesign.com.